Back when I was modeling, Preparation H was all the rage. Preparation H under the eyes. Preparation H whenever you’d had a few too many the night before and your whole face was puffy. Preparation H everywhere. It smelled terrible and made your skin look pretty awful, too. Except that it reduced puffiness. And he proceeded to stroke my chin upwards for several minutes. Then he walked away. It was surreal. But it made a lasting impression on me. Not enough to remember to massage my face every day, but enough that I’d remember to tell it in a little blog 13 years later. First, here’s your reminder jpg. It’s vitamin E capsules. The perfect thing to use in a facial massage. And you can click here to download the full resolution, iff’n you want to print it out. It stimulates circulation. This is the most important reason. When you rev your circulation, your skin begins a toxin release – exactly what you want. It tightens your skin. This is mainly because of stimulated circulation. You’re also “training” your face to go a certain way; which is usually opposite the way gravity wants to take it. It reduces the appearance of wrinkles. Again, circulation will help open up those areas where wrinkles have started to accumulate, and bring blood into vicinity, giving your saggy areas more life. It very effectively gets rid of puffiness. 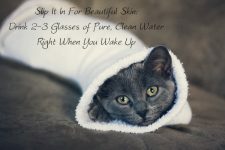 While I haven’t been good about daily (or even weekly) facial massages, I absolutely rely on a soft, quick tapping technique to rev up blood flow and reduce the appearance of morning bloating in a pinch. My favorite way to do a quick facial massage is by gently activating some acupressure points. Again, I haven’t been great about remembering to do this (like, maybe once a month when I’m particularly puffy, really). BUT, I hear say that a good regimen of daily acupressure massage acts much like a facelift. (In fact, here are about 200,000 websites that promise just that). You can do each of these exercises, gently, on a clean face every day for 60 seconds in each spot. These are but a few acupressure facial massage points. If you click on the link above, which takes you to the Google search, you’ll find hundreds more recommendations. These just happen to be the points that make me feel the best. As you can see, you need to (most of the time) work counter-clockwise with your middle finger and using a very light stroke. I think you’ll find, after the very first exercise, that you’re mentally stimulated, too. It’s a two-fer. I also like to finish with a light thrumming with all four fingertips under each eye. It just makes me feel energetic and, yet again, helps decrease any puffiness. This is something that’s easy, EASY to do on a daily basis, because you can incorporate it with moisturizing. It’s even better if you moisturize with an oil (like jojoba or apricot kernel oil). Place the oil in the palm of your hands and rub it lightly until you’ve built up some friction warmth. 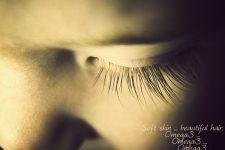 Place the flats of your palms smack dab in the middle of your cheeks (just under your cheekbone) and begin by slowly moving your hands upwards until the bottom of your palms reach your temples. Do this for one to two minutes. Now rub one palm over your forehead, swiping in a horizontal motion, changing hand directions. (Alternatively, you could very gently swipe your palm upwards over your forehead. Just don’t swipe down! It will only encourage wrinkles.) Do this for one minute. Finish by placing your thumbs under your chin (with the thumb tips facing your neck), and gently massage back and up. Here, you want to encourage your skin to pull back and upwards around your jawbone. This will help reduce a double chin (with time and repetition). Watching this YouTube video made by OxfordJasmine. The best time to do this is: Whenever you remember. It’s best to do it with a clean face, as you’ll be rubbing in whatever’s on there. The girl in the video above used it while cleansing. Personally, I think it would be better with a light bit of oil on an already clean face. Like I said: The perfect thing to do while moisturizing. And, it can take as little or as much time as you want it to. Making it, of course, something you can slip in for beautiful skin, with hardly a change in your daily routine. So today, I have a nearly completely off-topic question for you guys. I’ve never had a professional massage. EVER. I’ve also never received acupuncture or a hot stone treatment or … well … anything personally indulgent and relaxing like that. Do you have any recommendations? What’s your favorite spa-type or Eastern-medicine relaxation type treatment? I’m thinking, after 36 years, it might be time to look into doing something like that. 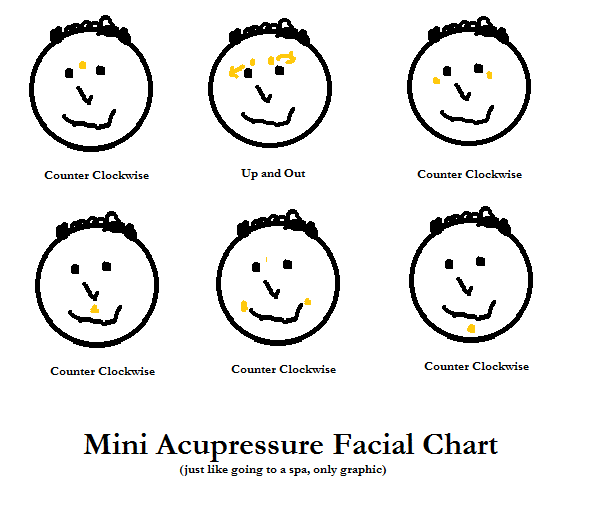 Okay, so forgive me for being a little dense… in the acupressure/massage you illustrated (beautifully, I might add) above, when I massage the corners of the mouth, I do both sides going counter clockwise? It just feels a little weird massaging away from my mouth on the left side and then in towards my mouth on the right side…ya know? Should I be massaging clockwise on the right side of my mouth so that I’m going outwards? I don’t know if the video you linked explains this, my internet is boycotting streaming video so I can’t watch it right now. Thanks! I love these little “slip it in” posts- they are fantastic! I am such. a. dolt. I wrote this post at 11pm last night and first tried to explain everything with words. Finally, at 1:00, I gave up and did the little graphic chart. When I made the face, I just copied and pasted the words underneath over and over again, without even remotely thinking about what it actually meant. I think I might’ve already been dreaming. Anyway, it DOES feel weird, and really you want to go counter-clockwise with the right hand and clockwise with the left. Don’t pull the skin down over the mouth where wrinkles are likely to show up, y’know? If you do it that way, it doesn’t drag the skin down the way you don’t want it to. PLEASE GO GET A MASSAGE!!!! I had my first from a dear friend who just so happens to be an LMT a few months ago and my spine felt six inches longer. It is so cool. And may it be the first of many more to come. Yay! I have had chiropractic treatment before (only three), and that’s how my spine felt after that, too! I’d love to get that feeling back again, without being afraid someone was going to snap my neck. I swear, it was such a dichotomy: I felt so good after my chiropractic treatments (which came about because of throwing my back out so far I couldn’t stand up straight), but I was always just a little jittery on adrenaline, because I was so afraid he’d slip and crack my neck. Heh. I’ve had the Swedish massage. I like it, but sometimes I feel I need someone to get aggressive with my shoulders, since that’s where I carry my tension. The Swedish just doesn’t seem to quite get there. I’m having a hot stone massage on Friday with my mom and sis-in-law to get prepared for my wedding on Saturday, 6/25/11. Sorry, I had to put that in there. I’M GETTING MARRIED! Whoops, there it goes again. I would start with a Swedish massage since you never had one before, then go from there. YAYAYAYAY! Congratulations! You have to have to have to share pictures! Also, as someone who’s walked down the aisle before, here’s my unsolicited advice: Stay away from anything with garlic in it at the reception. Also, kiss him often. I was going to eat garlic flavored garlic with garlic garnish. Shoot. I’ll have to rethink that. Regarding massage….I used to work in the spa industry before my finance days. I spent about 5 years around massage therapists, esthetitians,and nail techs in 2 high end spas. I would strongly recommend meeting your massage therapist once before booking an appt and just diving in. Just like in life, there are ALL sorts of people offering massages (even at good establishments). Some people are really into their craft and will give you a great experience. Some have strange backgrounds and you realize after talking to them for about 1 minute that you don’t want them rubbing your body. If it’s a guy and you feel even the tiniest bit of flirtiness, run away. You won’t be able to relax if you think some dude is eyeballing you. Conversely, if it’s a female massage therapist, and if you want what’s called “deep tissue” massage, make sure she is strong enough to give you what you need. I knew a tiny lady who was able to give a great deep tissue massage because she knew how to use her elbows to go deep in the muscle. I like kind of between “swedish” (relaxation softer approach) and “deep tissue”. If you have specific areas that you want more time on, make sure you verbalize that. This way, you get what you want. Another thing–if you don’t want to talk during the massage, let the therapist know. Some people like to be talked to during a treatment and some don’t and they will appreciate you telling them what you want. P.S. Can I buy more face scrub from you? Oh, nice. THANK you for the tips. It’s one reason I’ve never gone to a massage therapist … just wondering whether I’d be creeped out by a stranger mushing their hands into my bare flesh. This TOTALLY helps. All your comments help. You should have a blog. Or an advice hotline. Or a column. “Dear Karlita …” It flows. I have exactly two scrubs left, and they are absolutely yours for the buying if you want. Same price, same everything. I’ll be happy to see them find a new home. And, anyway, you’re the one who started the whole scrub thing this time; it’s only fitting that you’re the one to get the last of it. You know the drill, right? Actually, you could just use the Paypal donate button to the right over there and put in $15 if you want one or $30 if you want ’em both and we’ll be good. I still have your mailing addy, and I’ll get it out ASAP. Coolness. I am in the middle of breaking up with Bank of America and moving my petite funds to a credit union. I just put my new card info on Paypal which takes them a couple days to authorize. I will send the funds Monday if all goes well. I would like to reserve both cups if you don’t mind. Thank you muchly for the excellent tips! As far as massage recommendations, I, personally, love Thai massages. They use stretching as well as pressure to help get knots out, which is pretty cool. However, Thai massages aren’t as common in some areas, so I dunno how helpful that is. To agree with earlier posts, a good therapist is super important, because some places / people are down right sketchy. Enjoy yourself! These tips are great! I’ve used a grape and a strawberry on my face now, it’s just fun. And oh my goodness, I went and stocked up on some crunchy ingredients yesterday, and I tried the facial massage with a bit of grape seed oil and vitamin E this morning as soon as I read the blog. Wow! Crunchy Betty, if you or Skip have health insurance through work, you could look into whether or not your plan covers chiropractic and massage. Many plans include a bit of that nowadays. Also, you could go to a physiotherapist and ask about stretches and exercises you can do, and they can recommend a massage therapist or might have one on site. My back goes on strike regularly and I’ve found that weight training, jogging and chiropractic care are the best things for it. Hope you and your back can be friends again soon. Is olive oil okay to use for the massage? Thanks! One thing I’ve noticed a trend on is that people who use olive oil for the oil cleansing method sometimes have issues with breakouts – and the culprit seems to be that they’re using iffy olive oil that’s not extra virgin. Ok, if you’re doing OCM…aren’t you doing some facial massage then? I will definitely try the recommendations though. I also have never had a professional massage or spa service so I told my husband the next time he gives me a gift, that’s what I want. Yep. I thought the exact same thing as I was watching her do it. 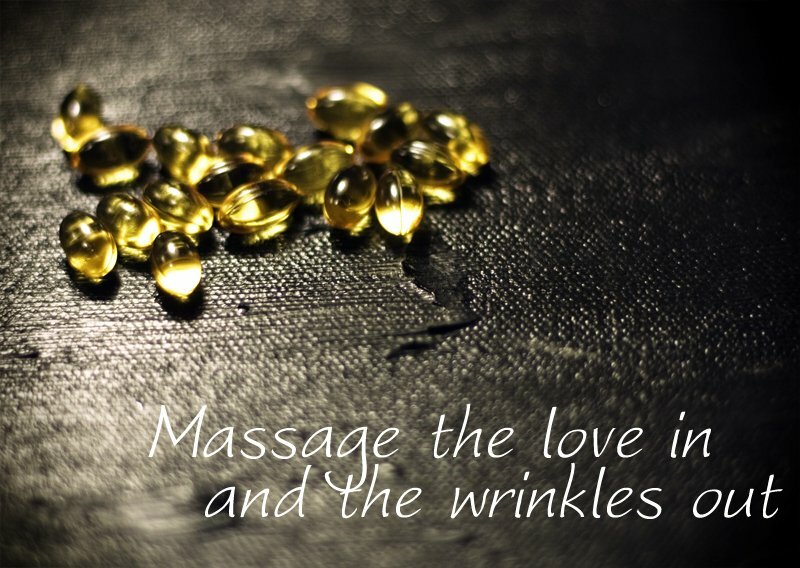 If nothing else, it might give you some great ideas on how to massage in different ways to both relax and rejuvenate your face while you’re OCM’ing. I’m thinking we could do the face massage at the same time we do the OCM? Kind of a two-fer? What do you think? YES… go get thee a massage, girl! I’ve had lots of them (mostly for physical therapy) and they’re very beneficial. Depending on how bad your back feels, you might start with either “relaxation” or “deep muscle”. I so wish you lived near me, my PT is absolutely wonderful and super crunchy! Since you don’t :(, ask people you know for recommendations for local therapists or spas. Heh. You read my mind (and not just my words … weird). I was thinking that the whole time I was watching the video, that the method of massage is perfect for OCM. I think the way I’d do it, though, is the “full on” relaxing massage with the OCM and then do the acupressure-ish stuff after washing the OCM off. Just to get all the impurities off before you finish everything. I don’t know why … it just seems more reverent. I love this…I was recently advised of how to do a lymphatic drainage on my face (which is kind of like massage) to help reduce the signs of puffiness. One thing I would add though, is that if you are doing this kind of massage with any frequency, it is always better to ‘pump your armpits’ so that the lymph can drain properly. The ‘pumping’ consists of crossing your arms, simply massaging lightly in the armpit area. As far as massage…I started with hot stone massage first. It was glorious. I now have to have medical massages because of my Chronic Fatigue Syndrome. You’ll pick a good one! L-O-V-E dry skin brushing. I kinda had a hard time finding Dr. Berkowsky’s method on his site, but I’m totally down with learning new ways. Also, I’m featuring your comment in tomorrow’s post. Because I love the thought of pumping my armpits. THANK you for the wisdom, yo. Definitely get a massage! I think I need to book one soon. So good and you deserve it! I used a potato on my face this morning and I’ll be darned, it kept a lot of the oil at bay! I just used a lime wedge on my face and it now feels soft and looks vibrant. Facial massages are good, but have you heard of Facercise? That’s the best way EVER to keep our faces looking young and toned. The face is full of muscles, just like the rest of our bodies. Makes sense that we should exercise them to keep them shapely as well! I seriously think I watched a video of someone doing facercise, like, the second week I was ever on the internet. It’s SO funny to watch. But it definitely makes complete sense. I think I’ll figure out a little program to do first thing when I wake up. My first facercise routine, though, really needs to be smiling. A LOT more. Hehehe. 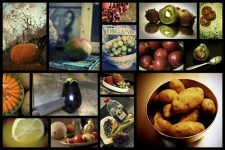 I’ve just found your site and LOVE it! My dad is an OMD (Oriental Medical Doctor) and I’ve been having acupuncture treatments since I was a baby! If you can find a reputable practitioner I would definitely recommend getting a treatment sometime – but there are a lot of wackos out there so you have to be careful. You can get treatments for anything – I get them a lot for sinus/allergy issues and really tight shoulders (it’s where I carry all my stress). What area do you live in? Some are easier to find good people in than others. Oh you lucky thing! That sounds like what I need, given that’s where all my tight achiness is AND I also have sinus pressure. I live in the Colorado Springs area. One of my big plans for this blog is to do series of posts about alternative healing … as soon as I can afford all the treatments. Welcome here! It’s so nice to have you. I’ll be you’re going to have lots of great insight for us. Mwah! Other fake oakley sunglasses famous people an individual wearing Berkshire Chase Eyeglasses are Harrison Ford, Ralph Lauren, Robin Williams, Eric Clapton, John Lennon, and Kevin Kline. Hi I have read with interest your info regarding facial massage. Do I actually move my fingers when massaging or just apply pressure on the points described?